Summon: Give a friendly creature Drain this turn. Pillaging Tribune is an epic Willpower creature card. It is part of the Core Set. In addition to the card's availability in the Core Set, one copy is included in the Redoran Onslaught theme deck. "Burn it all to the ground." 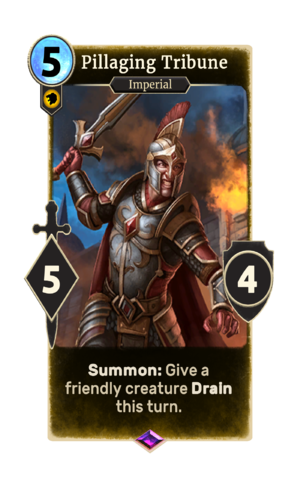 Prior to January 2017, this card would give all creatures in its lane drain for one turn. This was changed due to its ability to gain you much more health than was previously lost. This page was last modified on 15 February 2019, at 12:10.